I begin in Part II with a brief sketch of the history of stated policies to expel Palestinians from what is now Israel and the Occupied Territories, and then examine recent proposals that have been made and actions that have been taken to implement modern re-articulations of those historic policies. In Part III, I then review the grounds on which international law proscribes mass expulsions of indigenous and occupied peoples. While international law governing this issue is clear in its application and has been overwhelmingly endorsed by the larger international community, international law seems to have little influence on Israel's conduct. For this reason, my primary focus in this Essay will not be to analyze the international law issues, which have been exhaustively discussed elsewhere. I focus instead, in Part IV, on the enforcement of this well-established international law through private law suits. I review both civil adjudication's promise as an enforcement mechanism and the many obstacles that stand in the way of its success. 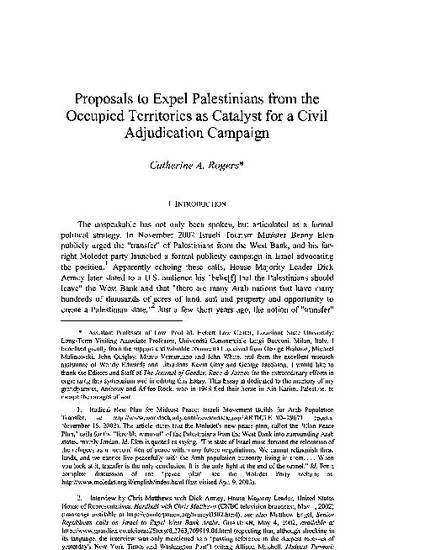 I cannot in the space of this Essay analyze or resolve all obstacles, but I hope to outline the various benefits and limitations of adjudication as a response to human rights violations in this context, and to proffer a checklist of some of the important practical considerations entailed in launching an international civil litigation campaign on behalf of Palestinians.